The German city of Freiberg in Saxony, southwest of Dresden, is well known for its organ, built in the cathedral between 1711 and 1714 by the famous organ maker Gottfried Silbermann. 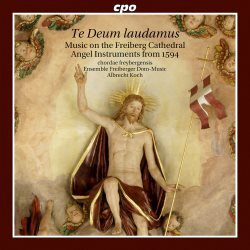 This disc sheds light on another interesting aspect of Freiberg's music history, the repertoire which is preserved in the library of the Latin School which was closely connected to the cathedral. This is a most interesting disc which deserves a better booklet. It is riddled with errors: the tracklist spells Philippe de Monte's name consistently as "Pilipp" which is quite embarrassing. The additional text in Lechner's motet mentioned above is omitted from the booklet, and so is the first Osanna from the mass. The title of the first piece is printed as 'Cantate dominum' instead of 'domino', and the beginning of the Credo says "Credo in unum Deo" instead of "Deum". I am also puzzled by the subtitle of this disc "Music on the Freiberg Cathedral". Such things don't spoil the enjoyment of the music but gives this production a rather amateurish look. Fortunately there is nothing amateurish about these performances.